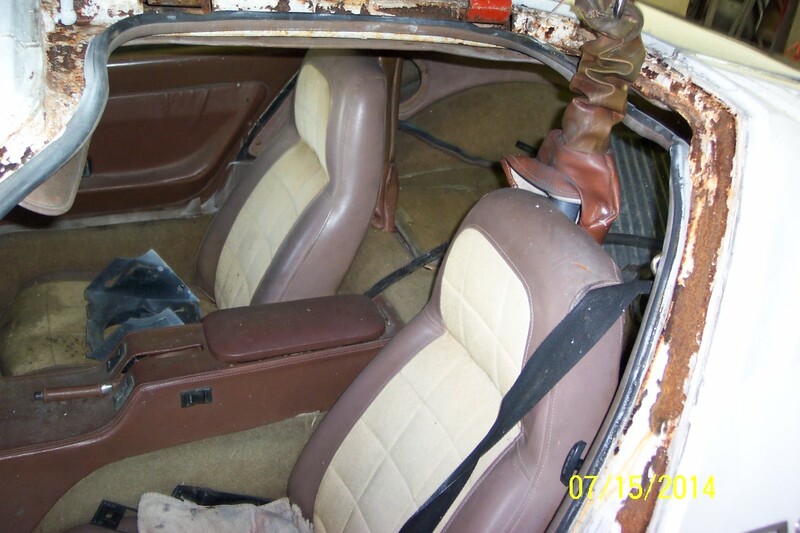 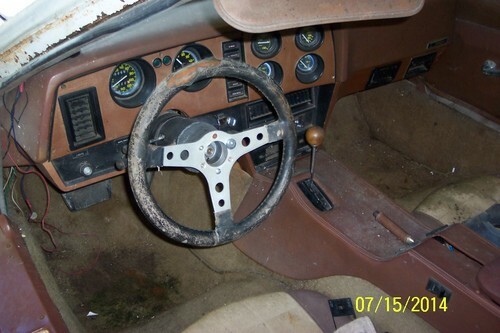 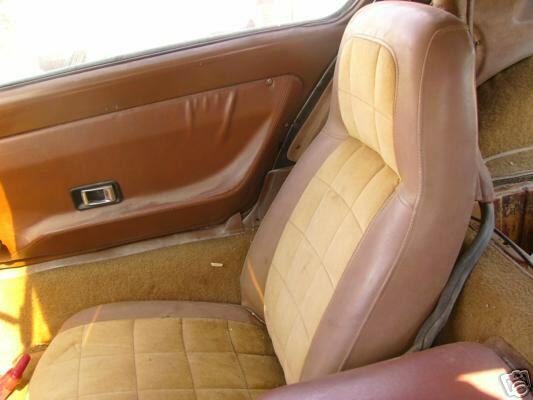 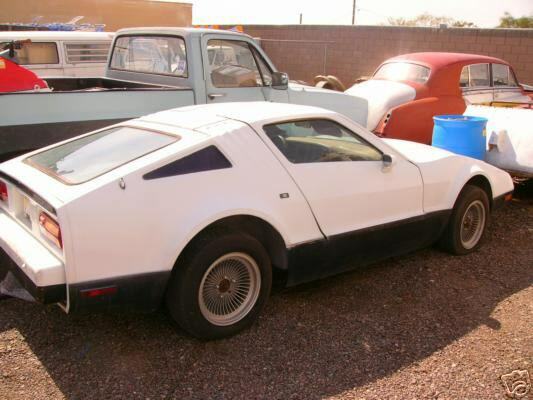 All 5 VIN Bricklins were 1974 Safety White Bricklins, with an Automatic Transmission. Perfect for a Police Car. 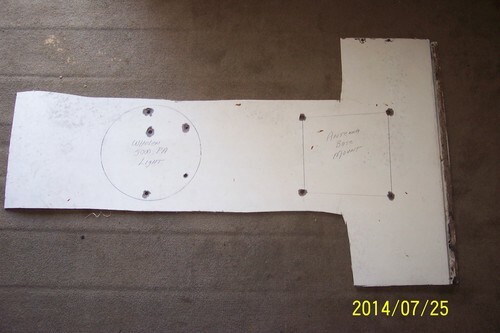 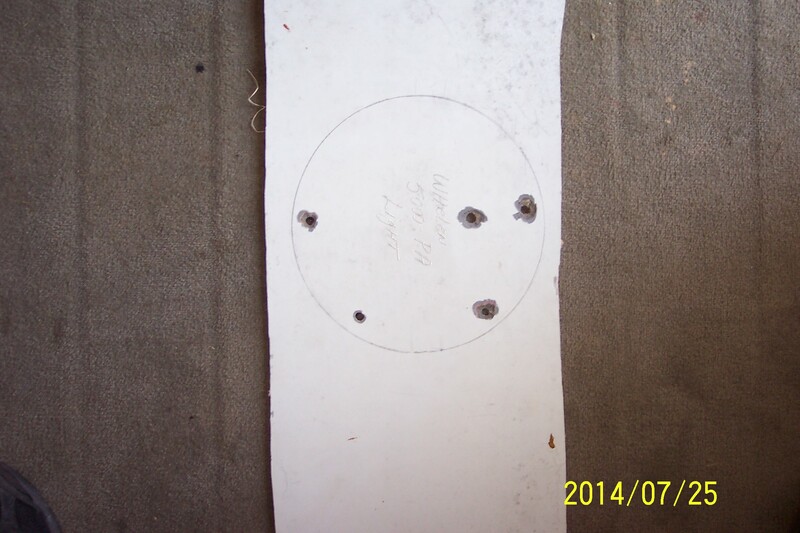 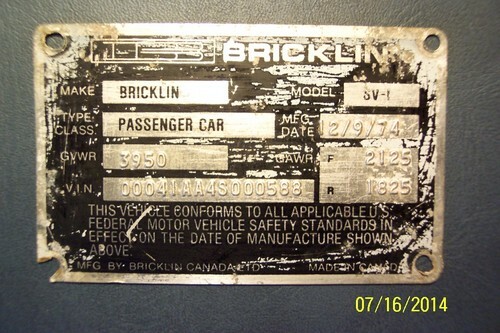 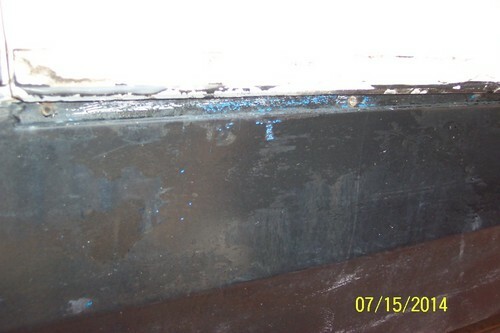 Shown here are photos / documentation of the 5 Bricklins. The 3 Bricklins used were labeled on the side: TEAM 1, TEAM 2, and TEAM 3. 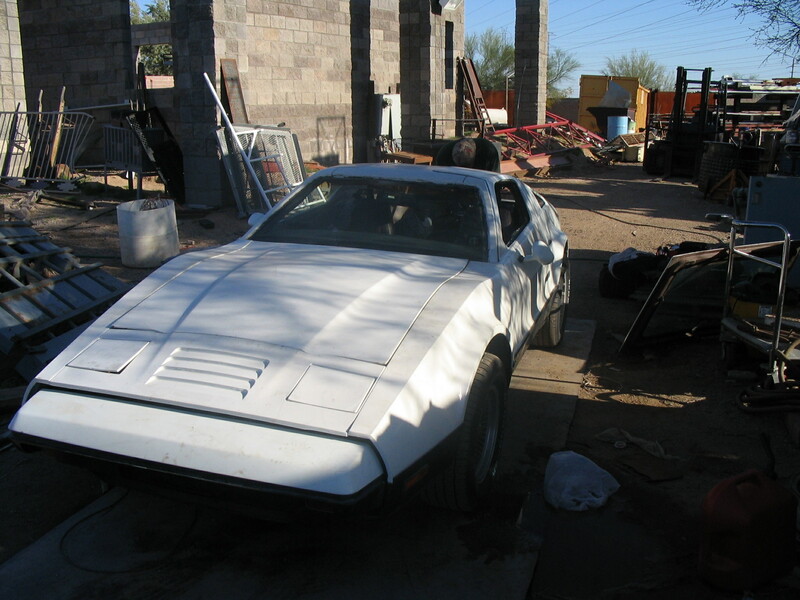 It is not known which TEAM numbers were assigned to which VIN SPD Bricklin. 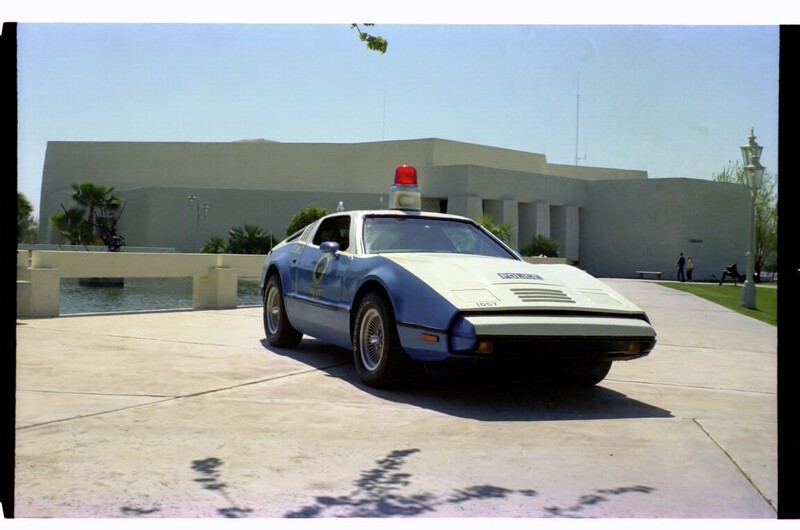 Although searched for, the only one to be found to this point, is VIN 588, which Kerry Stark purchased, and has been restored look the way it looked in 1975, when it served for the Scottsdale, Arizona, Police Department. Most photos are via / courtesy of Kerry Stark. 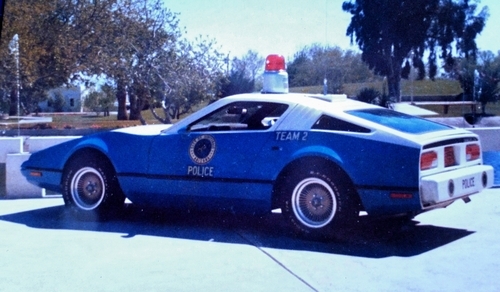 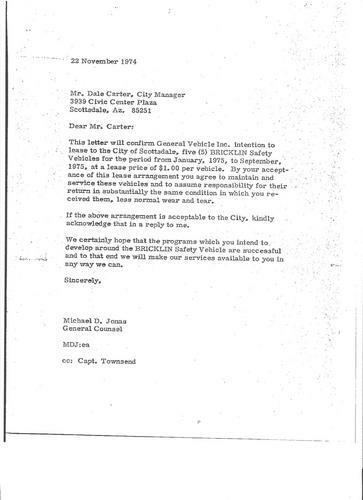 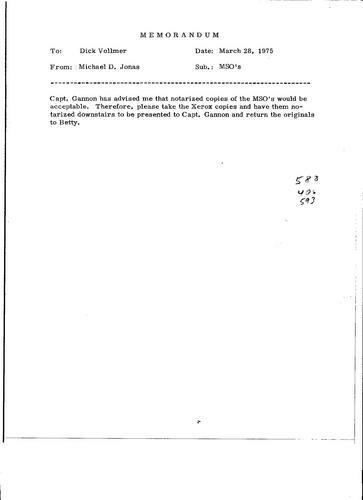 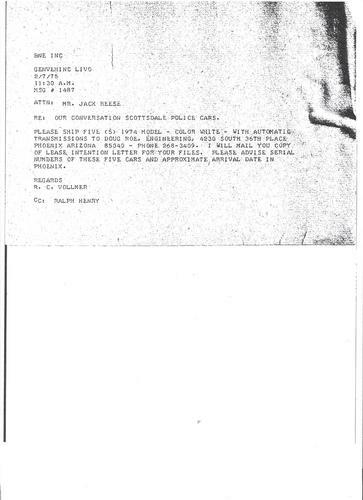 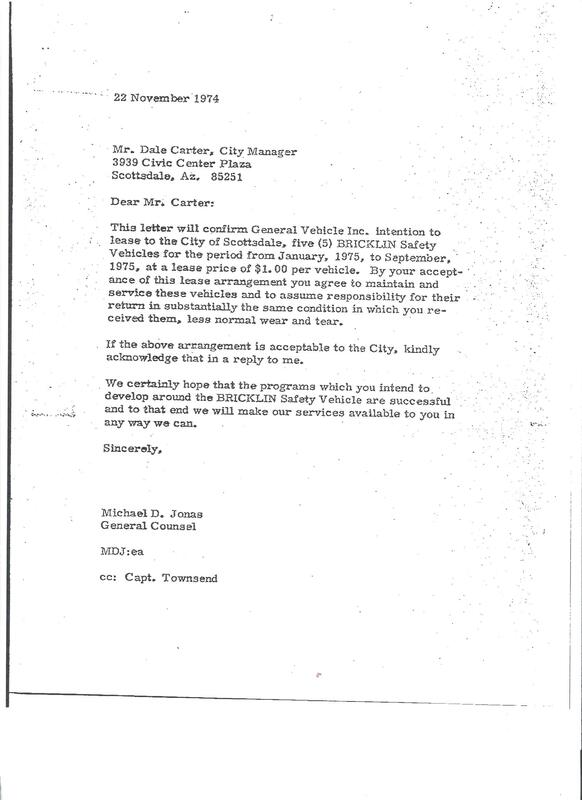 Referencing the Bangor Daily News, December 27, 1974, Captain Gannon of the Scottsdale Police Department ( See reference in the documentation ); the idea early on, had all 5 Bricklins been delivered, was to fully deck out 3 of the SPD Bricklins as regular Police cruisers, and the other 2 left as unmarked vehicles used by administration officers. 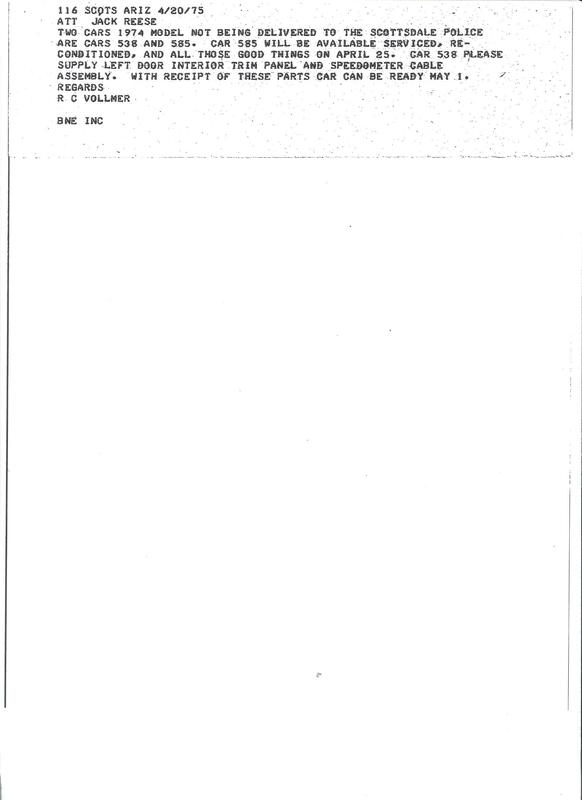 However the 2 unmarked SPD Bricklins never materialized, only the 3 Police Cruisers. 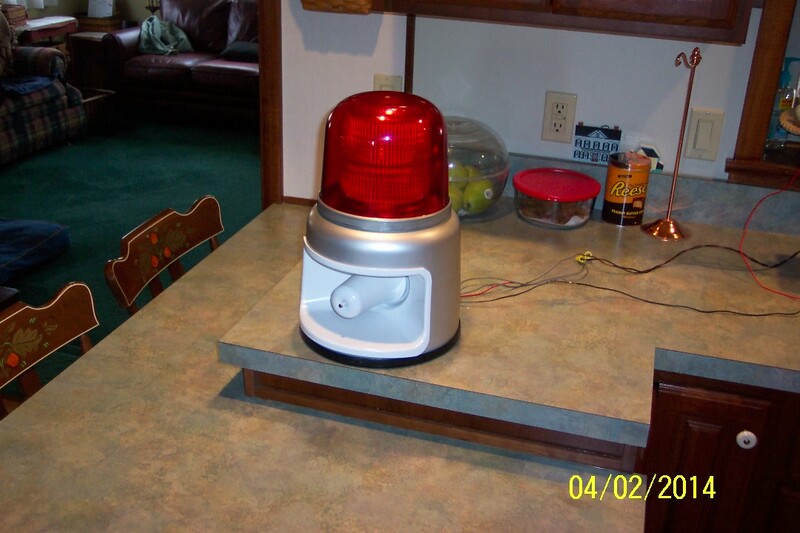 In case you are wondering about the beacon light used on the Bricklin Police Cars, it is a Whelen Model 5000 PA. 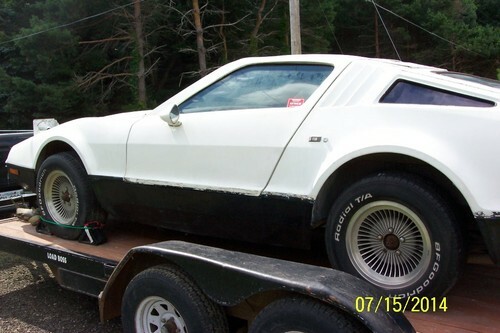 Almost impossible to find. 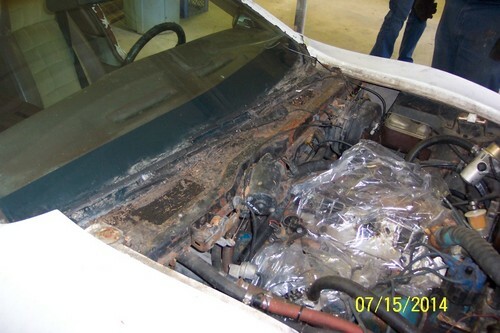 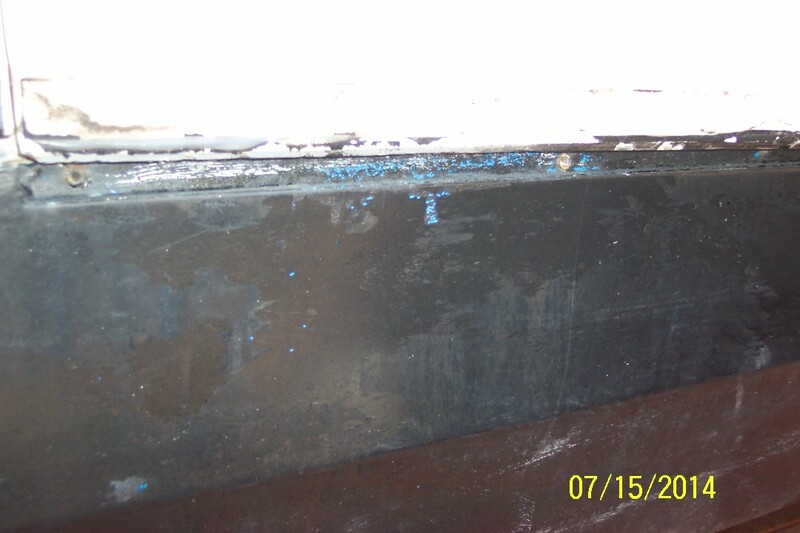 Kerry says it was more work locating a Whelen 5000 PA for the restoration of VIN 588, than locating VIN 588 itself !!! 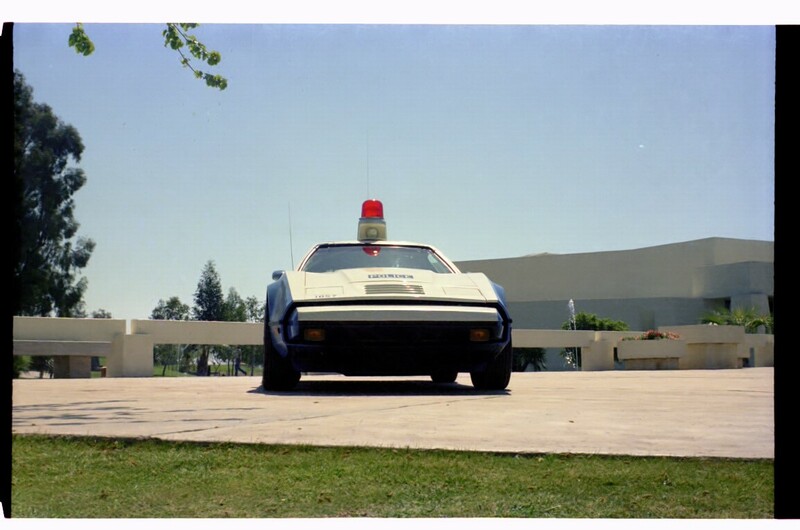 Many thanks to Kerry Stark, and Rich Haines for making this page possible, and finally solving the mystery of the VIN Numbers of the Bricklin Scottsdale Police Cars. 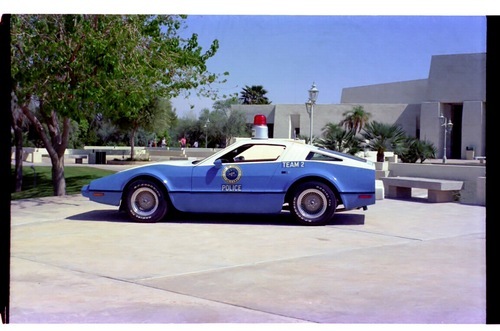 In addition, if you happen to have any photos of the Scottsdale Police Department Bricklins, and would like to share them, or any other information about them, please contact me at the above email address. IMPORTANT NOTE: Click on any of the photos to enlarge for further inspection - some will enlarge. 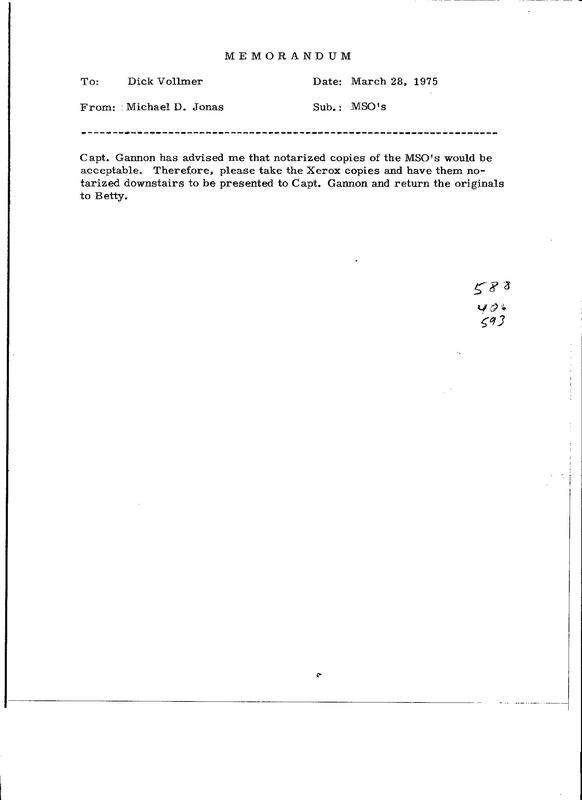 ON THE DOCUMENTATION PHOTOS, DOUBLE CLICK THE DOCUMENTATION PHOTOS FOR EASY READING AND STUDY. 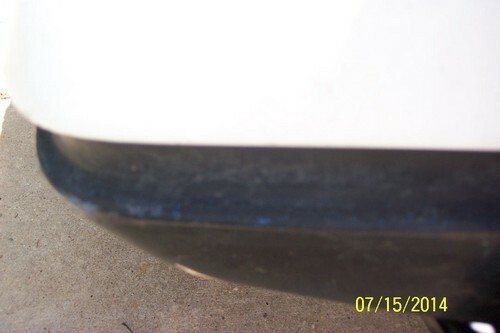 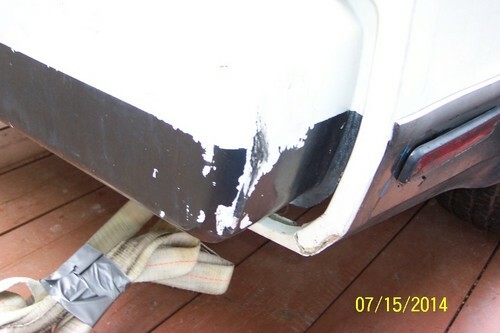 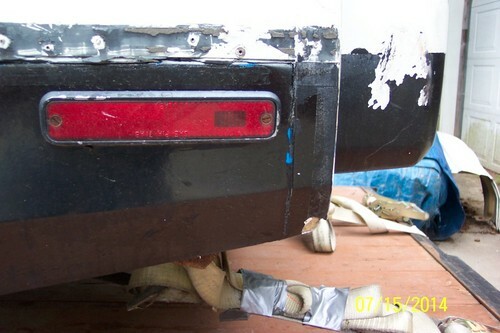 VIN 588 left rear quarter view - note white paint on rear bumper peeling with white paint under the black paint, where the black paint has come off. 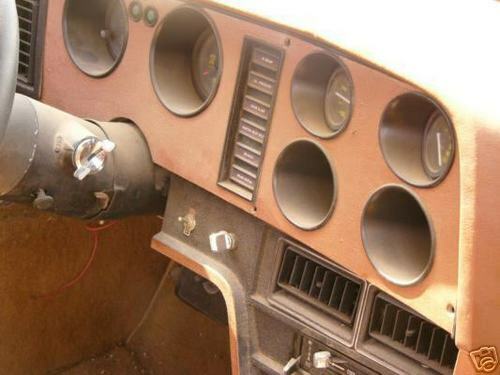 VIN 588 Dash post police car. 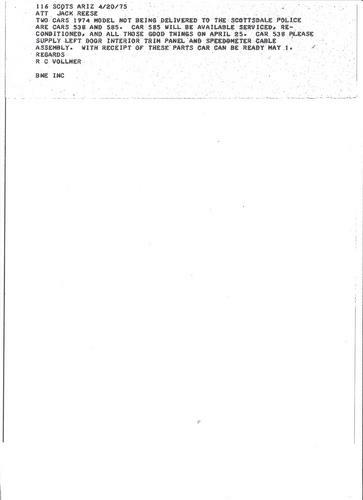 SPD documentation Page 4. 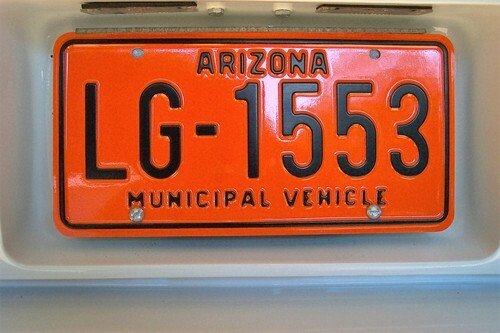 Note hand written VIN Numbers used on the right side of the letter. 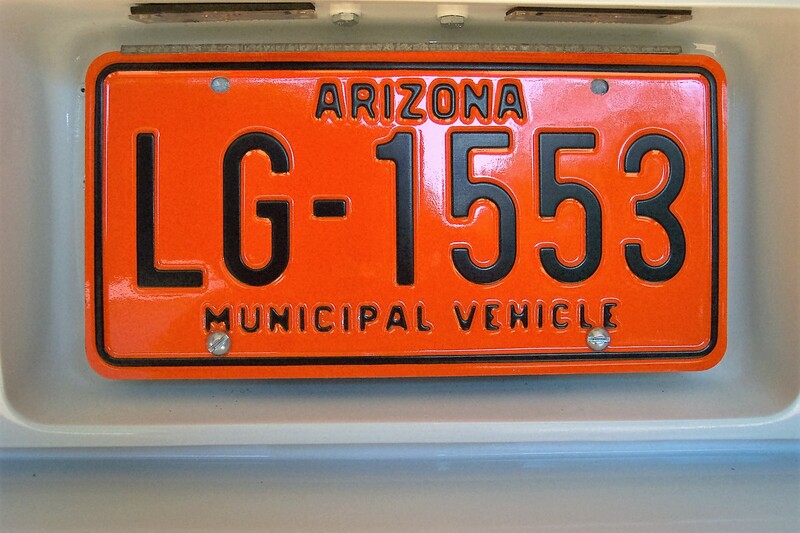 The TEAM 2 Scottsdale Police Department carried the Arizona Municipal Vehicle license plate: LG-1553. It is not known which license plate numbers were assigned to the TEAM 1 and TEAM 3 SPD Bricklins. 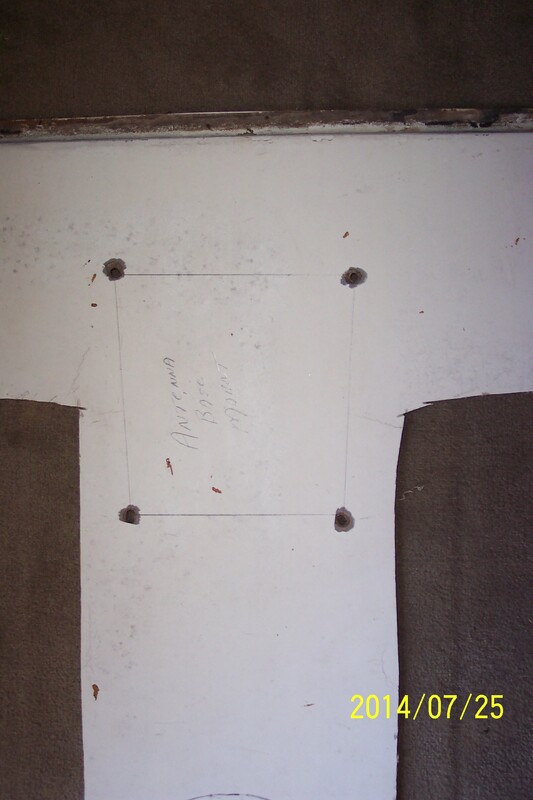 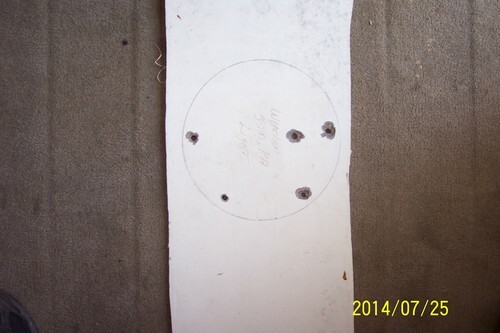 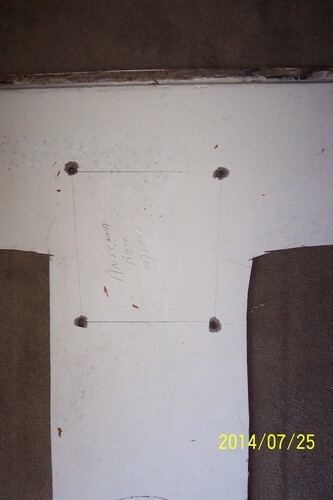 Excellent reproduction plate shown here for authentic display purposes. 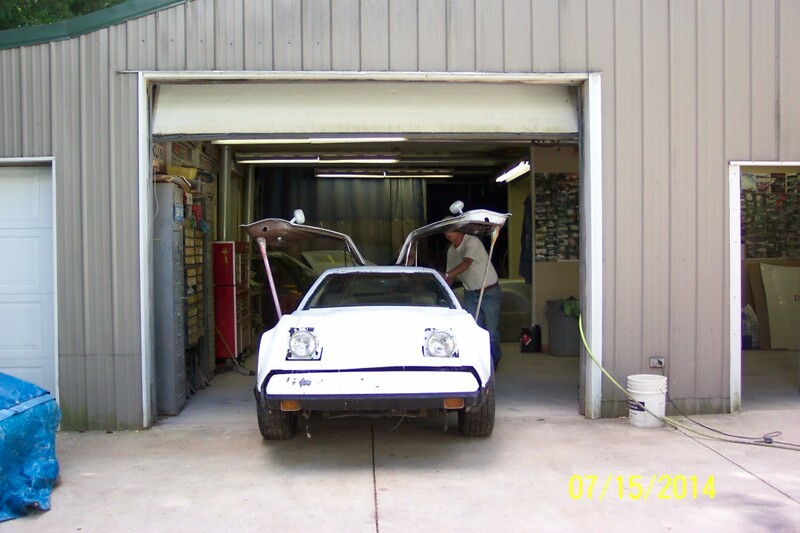 Poor quality image of the TEAM 1 Bricklin. 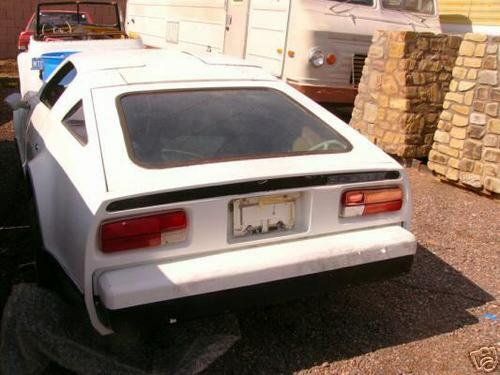 Despite the quality, it can be seen that the TEAM 1 Bricklin has the elongated "B" emblems and possibly the "SV1" stickers on the front fenders, unlike the TEAM 2 Bricklin which were removed. 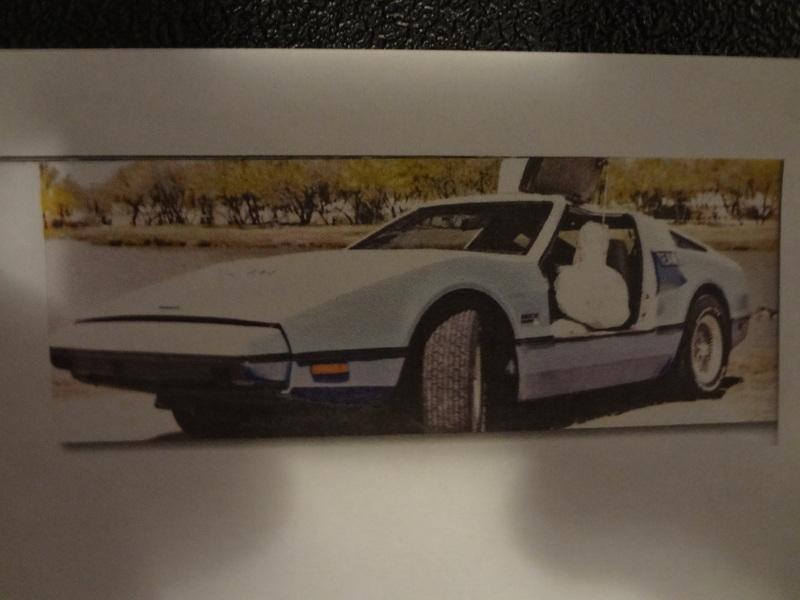 Modified / edited, this is 1 of possibly 2 known surviving image of the TEAM 1 Bricklin, at the moment. 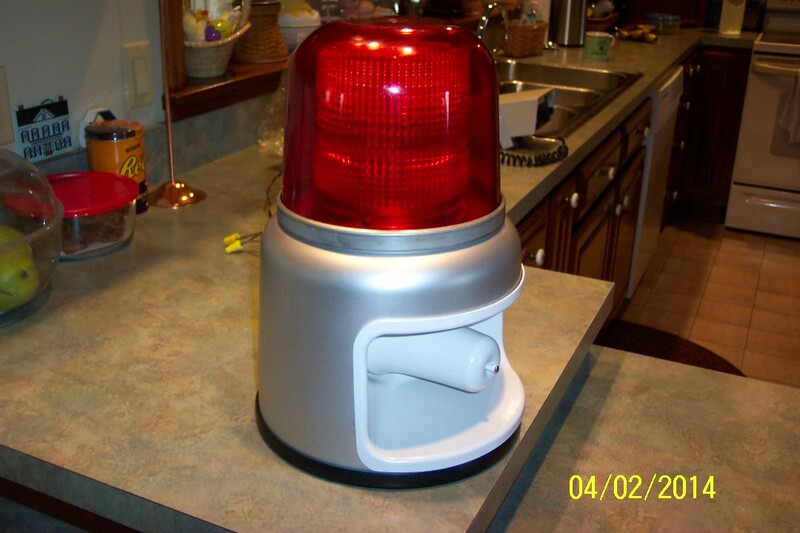 Whelen 5000 PA appears NOS and ready to install on VIN 588.